The Big World And Me | A tale of an honest, introverted, realistic, ordinary and very normal young woman. With a passion for fitness, well-being, procrastination and people. A tale of an honest, introverted, realistic, ordinary and very normal young woman. With a passion for fitness, well-being, procrastination and people. Good morning people, so I just watned to update here and let you all know that I am off for a week to Aviemore with a good friend. Im sure I will have plenty stories to tell when I am back, I will be sure to take LOTS of photos. 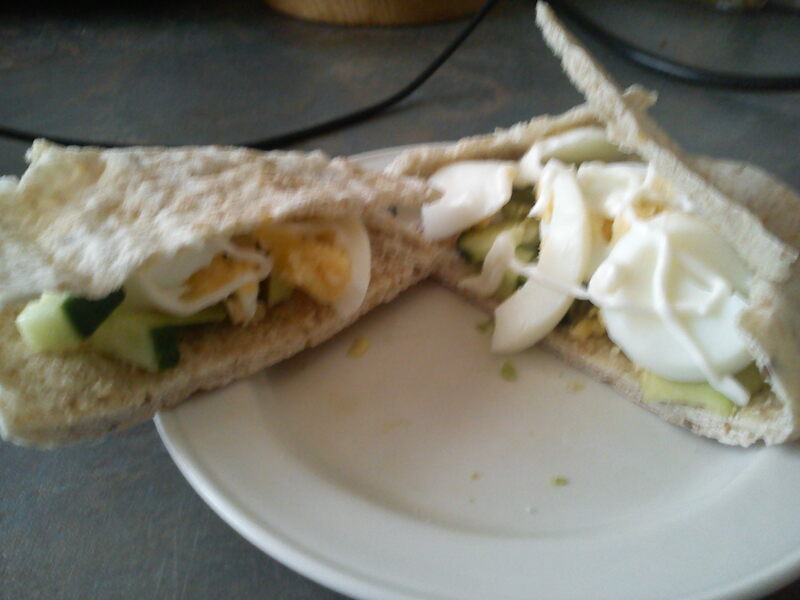 This was Tuesdays breakfast: small pitta with boiled egg, avocado, tomato and a smidge of mayonnaise…it was deliscious – I apologise for the crappy photo though. I hope you all have a great week, I know I will! It had been 6 years since I last went to a live concert, I was 15. Although my cousin and I were sitting far at the back in the Glasgow SECC, Iron Maden were a joy to watch. Their performance was particularly powerful and I enjoyed every minute of my time being there. Now thinking about I am extremely glad I was NOT standing – the idea of being sucked into a circle pit at the age of 15 seems like a terrifying experience. The supporting band, Trivium, warmed up the arena magnificently. The full gig was a “metal-heads” dream. During the time I got their first album I was already in my first relationship, we were actually on a rocky stage and I found comfort in listening to The Script’s album. When their second album was released I jumped at the chance of purchasing it, and just as I expected I loved them even more. 2 months ago I would never have thought I would be seeing The Script live! But I did, and that was last night at the Glasgow O2 ABC arena. Just like Trivium warmed-up the anticipating crowd before Iron Maden, a young man called Josh Osho did the same thing last night. Josh’s music has a kind of Bob Marley feel to it, but more of a modern twist to it. He is young, fresh and I can tell he will go far in his music career. 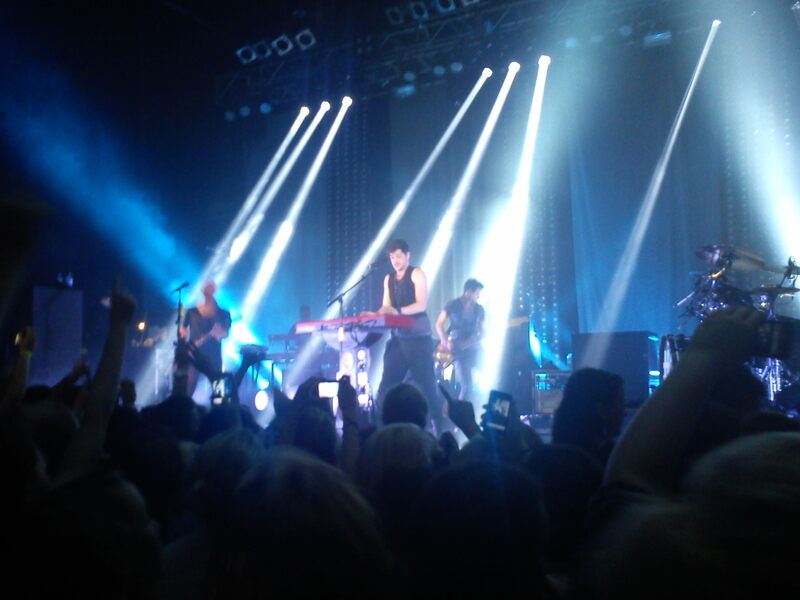 After a half hour wait when Josh finished, the full arena waited anxiously for The Script’s entrance. I could empathically feel the excitement everywhere. And finally, the lights dimmed further and a streak of royal blue lights lit up the stage awaiting for the band. Finally, they came running out on stage. Cheers were everywhere, whistling and clapping echoed the entire venue, the thunderous screams from the fans pierced my ears. It was like this for the full hour and a half that they were on. They truly were amazing. I really enjoyed my time in Glasgow last night, the concert was superb. I still cannot fathom the idea that I was so close to Danny either, I think I was emotionally star-struck! The full evening was more than I imagined it would be, it was completely better than I had expected. I would see them again in a heart beat. Good evening 🙂 So I know it is Saturday but I was meant to post THIS yesterday…damn my un-organizational skills! One of my absolute passions is food. Good food at that. I truly love roaming around the internet on foodie blogs, it’s probably the highlight of my week. Most mornings that is what I do. I have decided to make Fridays my “foodie Fridays” this is where I will post about food that I have eaten throughout the week and enjoyed and post pictures of foods which I have eaten, something along those lines anyway. I admire health type blogs which advocate healthy living aswell as treating yourself too. I believe wholeheartedly in a balanced diet, one which is for life as opposed to just a month, you know? Fad diets are my absolute enemy. To me they are the most unstructured, unhealthy, unsatisfying, non-sustainable, under-nourished fad’s going around. I am always very curious about what people eat in a typical day; what they enjoy and don’t enjoy, how they cook their meals, what they take in their coffee, if they have ever been on a “typical” diet and if they go to restaurants, then what kinds of things do they order? Do they order sides? Order things without added blah blah blah? So yea, I’m jumping on a bandwagon of showing the public how I eat. I hope these types of posts become a good habit of mine, and I would hope that people would chime in with their opinions on things. Today’s post is just short and sweet as this is a complete spur-of-the-moment thing! 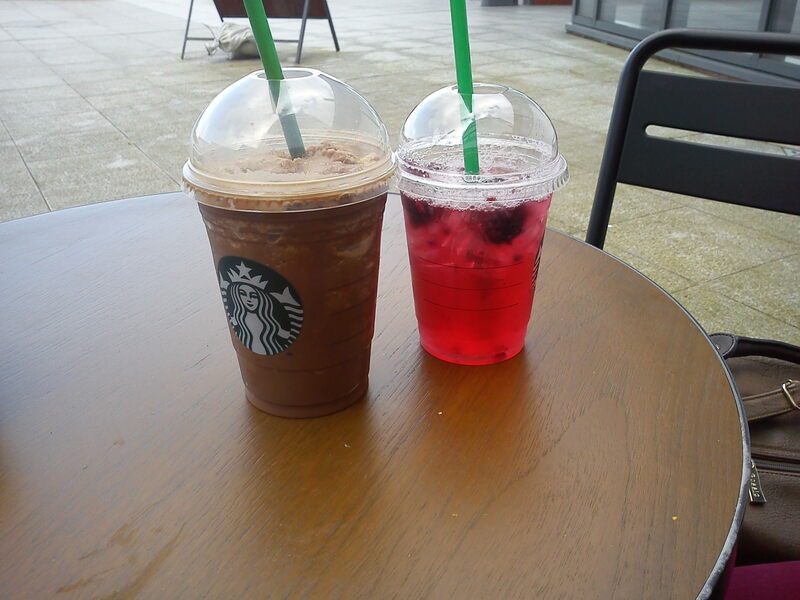 So my Mocha light Frappe with extra Soya milk and my friends Berry Hibiscus. Good morning guys, I seem to have gone missing for just under two weeks! It hasn’t been intentional, I promise. I figured an update was quite essential. On the 24th of August I had my induction for college, safe to say everything went better than expected and I am glad I did decide to go back to college. It was a quick day but I was filled with excitement, nerves and anxiety all at once…scary stuff. That weekend I struggled to sleep, pretty badly – bed at 9pm, up at 11pm, slept at 3am, woke at 4.30am for work – this time pattern continued right through until Tuesday, the day I officially started college. Thankfully though on Tuesday evening I slept like a baby and have done ever since, until this morning. I think it was just my nerves and my anxious state which kept me from sleeping, im sure it was. I think when your anxious your mind just finds it so hard to drift off to sleep, that was the main problem I struggled to fall asleep and get back to sleep after I had woken up. He hit the nail on the head with that one, I believe there’s a glint of these feelings deep within bloggers. I mean we are only human so of course if we spent hours typing away and putting a lot of effort into a post which reflects perfectly our points of views and feelings, we would be completely taken aback and feel as though someone put a bullet through our throat if other bloggers attacked us in a sense and disapproved of our creative words. Perhaps not a bullet but you get my drift. We would feel creatively and emotionally hurt, our posts there after MAY even change in ways to reflect the harsh opinions of that person. But it truly depends on our perspectives. If we have a positive outlook on life it is possible that some off-putting comment wont affect us that badly as opposed to if we had a negative outlook on life. Back to college. So for the past couple of weeks that is what I have been getting up to and why I have not had the time to be fully present and write a blog entry. I am studying an NQ Access to Applied Science course. It is the first time I have ever studied chemistry and I am in fact a tad worried that I wont be able to handle the course work, currently I am finding that if I read over and over my notes when I am home I understand it better than when I am sitting in the class. I sit in class feeling slightly anxious about whether my lecturer will pick on me to answer a question and I will just sit there with a red face shrugging my shoulders…oh the thought of it creeps me out. I hope it never happens. Do any of you guys dislike speaking out/answering questions in front of class? Good Morning! How you doing? So for a long time, probably most of my life, I have always said to myself “third time lucky”. I did’nt quite ever have an example to share off the top of my mind until today. I had an appointment with my doctor early on yesterday morning and she had prescribed me some Azelaic Acid* in order to help me clear up my acne. I thanked her and off I went to the pharmacist to get my prescription. Turned out they could’nt get it as it was not in their system so they had advised me to go to another pharmacist. I had’nt had my breakfast yet and my feet were a little sore so I decided to go home before venturing down the town to another pharmacist. After a 20 minute stroll to Rowlands pharmacist I was sent away and told to phone them later on as they did not have any of my Azelaic Acid available at that time – they were going to order it in. I ended up phoning them about 4 hours later to find out if they managed to get any in and was told that there was a problem with the manufacturer and therefore I could not get it. I was gutted to say the least as I was really quite psyched on trying this cream. I took yet ANOTHER walk down town, a little quicker than the stroll previously, popped into Rowlands pharmacy and collected my prescription. There was only one other pharmacy left to try and that was Boots. I actually did not have high hopes at this point and my mind was already racing with ideas to get the next bus to Falkirk to try a bigger pharmacist. I went in and asked the lovely lady about my prescription and she said she would have a look. To my absolute surprise they had it in already! I was actually so happy when she asked me to sign and wait 5 minutes for it. Finally, success! As I was walking down town the first time I had a hunch that I should check out Boots first, however I did not listen to this little buzz of intuition. If I had I would have gotten the prescription straight away instead of all the faffing about and time wasted waiting. But it made me think alot about my beliefs, and I KNOW that one of my beliefs are infact “third time lucky”. I am a true believer that what we BELIEVE about life and ourselves is what is projected back to us, in many forms. Okay, so I know this example is’nt quite as dramatic or fantastic as what it could be…but it is perhaps a glimpse of how even the smaller everyday tasks can actually resonate with our own beliefs. There are many ways to stop the beliefs we have about ourselves and life. Alot of the time simple affirmations are all we really need to drill in a different belief and help erase an older one. I guess the saying “third time lucky” can be viewed a tad negatively in relation to many things, since, for example you may subconsciously believe this at an interview one day but during the interview this belief is right there telling you that your third interview will have a MUCH better outcome. Therefore this interview may not prove to be successful for you since you BELIEVE that the third time will be right for you, know what I mean? I do not think it is a bad thing at all, in ways life obviously has a better plan for you. Like I always say too, everything happens for a reason. Do any of you have beliefs? If you do, do you have any examples like the one I had? (possible better!) Also, are there ways which you have tried to get rid of any beliefs? Good morning. Well I must say I did not expect to wake up tired and exhausted at 4.30am and start a blog, but that is what has happend! I like to just “go with the flow” so lets just see where this takes me. I have many interests. My main interests, though, are fitness and well-being. The fitness one did’nt come to me until the age of 18, at this time I was in the middle of a mental breakdown with my eating disorder and depression. I hated fitness at school, absolutely loathed it. I was always that one girl who bearely took part, always having an excuse – seriously every single week I had my period as to not take part in swimming! During my recovery for my eating disorder a strong emphasis on fitness overtook my life. My main sport I guess you could say was weight-lifting. Mainly I underwent a really good strength training programme in order to help me bulk up and, to me, gain weight healthily. It was a goal which during the process of I fell absolutely head-over-heels with and wanted to help all my friends and family achieve their fitness goals too. I was a self-proclaimed gym-oholic, personal trainer, nutritionist, honestly I adored the gym. It was my crutch. I sought comfort in helpful blogs like The Daily Love and Always Well Within, and books from authors such as Louise L Hay. This wonderful new realm so to speak opened my mind dramatically and helped me to appreciate life. The idea of self-forgiveness, the law of attraction, self-love…a whole spectrum of spiritual/self-improvement topics were so welcomed by me. These wonderful writers have wholeheartedly helped me become a better person and brought the Stacey back that had got lost through the self-deprication of my less active lifestyle. I truly appreciate these writers and would reccomend ANYONE to have a read through blogs like these which truly help expand your mind and soul, thus helping you achieve inner peace. I totally value life so so much more now, and, when I am having a good week anyway, I look forward to every single day. Okay, so enough rambling for now. It is now 6.15am and I have been typing for an hour and a half, I would love to keep typing but I do not want to bore the reader! This blog which I have started will concentrate on MY life and who I was, am and who I want to be. It will focus on many things ranging from random babbling (which I do alot of) to food to lifestyle happiness, fitness, personal improvement…its really just for me to share some of MY experiences with anyone who wants to take the time and actually read it. I would love to help people one day somehow so if I end up inspiring somebody out there through anything I write then that would be awesome. I love that word, awesome. Have a truly awesome day! And thankYOU for reading!